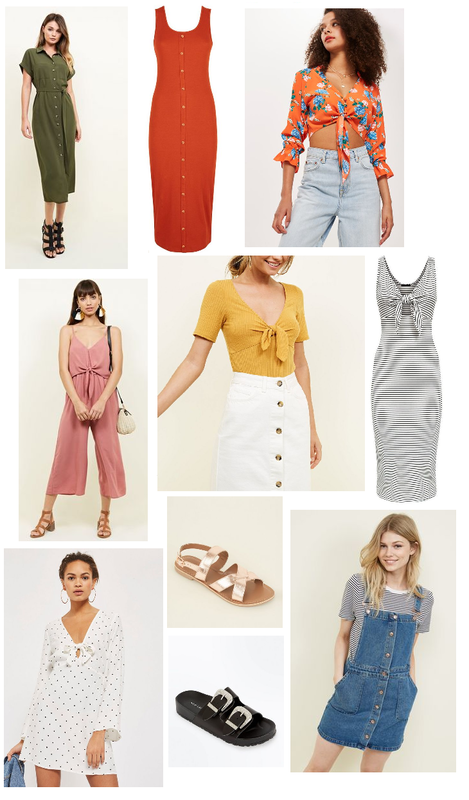 We have been having some seriously gorgeous weather so I wanted to share a few of my favourite summer trends and picks from the highstreet right now! I've always been a lover of a good summery dress and I tend to wear a lot of dresses throughout the summer, I have actually found myself reaching for comfy tshirts and jeans or culottes right now so I need to buy a few nice dresses for the summer months. I love this Khaki shirt dress, I think this would look fab with some tan sandals and a pretty round straw bag. I love midi length dresses and think they really suit me, they are also perfect for the UK as sometimes it's warm enough for a dress but I don't necessarily want to get my legs out. I love this plunge tie detailing on these dresses and tops right now, I think the bow detailing is so lovely and again add's a little subtle detail so a nice simple dress or top. Head over to www.upbra.com to check out their line of Upbra® Cleavage Enhancing bras, they use the new patented ActiveLift® technology to give more cleavage to smaller cup sizes and more lift to women with larger cup sizes, better than any other bra. These dresses will look so much better with a well fitted plunge style bra that gives a great cleavage. I love this pink /blush culotte jumpsuit and think it would be gorgeous dressed up with some high sandals or dressed down with a pair of flat sandals for the days time. I love sandals and I always buy a few new pairs of sandals each summer. I work in retail and wear sandals every single day of the summer even if it's raining as they look good with my work dresses and my feet get too hot in anything else. I love these Rose gold sandals, they would look soo good with any of these outfits, I really like these little black western sandals too and would pair these with something like white polka dot tie dress. I don't know what it is about dungaree dresses but every year I want to get one. I think they look super cute with a little stripe tee and a pair of converse, the perfect summer/ festival trend. So yeah i'm loving these summer trends and these are so bits that i'm loving right now, I really want to buy the Rust midi dress and I love the mustard top with the white button down midi skirt. What are your favourite summer trends?